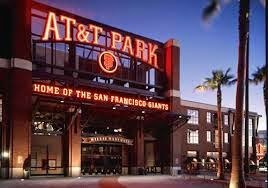 AT & T Park vs. Comcast Bay Area..Is the ball park really worth it? since I was ten years old, when I would listen to each and every game on an Oscar the Grouch AM radio on KNBR 680. The radio broadcast was listed in the "Sporting Green" of the San Francisco Chronicle delivered to my parents' doorstep, and if I was lucky, the game might be broadcast on television on KTVU Channel 2, and if I was VERY lucky, I might be around to watch it, as there were no DVR's when I was ten. If you wanted to go to Candlestick Park then and watch the Giants you could go for under 20 dollars, and this would get you a lower level seat. But, my readers, the Giants sucked then. They really did. In 1985 they lost 100 games and finished 33 games out of first place. Cripes! It wasn't until 1987 that the SF Giants finished in first place in the National League West, winning 90 games and reaching 1.9 million in attendance at Candlestick, which is still only about 55% of last year's attendance at AT&T, a considerably smaller ballpark. There have been some lame years since then, but in general the Giants have been contenders. They have moved into their own ballpark and have three World Series Championships. The only seat under 20$ now is standing room only, and that is not for a day game against the Dodgers, in that case you will pay 30$..to stand.